For other people with similar names, see Christopher Fowler (disambiguation). 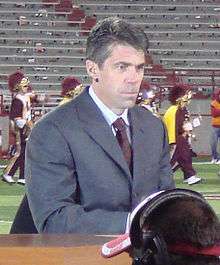 Chris Fowler (born August 23, 1962) is an American sports broadcaster for ESPN known best for his work on College GameDay, which he hosted between 1990 and 2014, and for college football. Since 1989, Fowler has been the primary studio host for college football. In 2014 he replaced Brent Musburger as the play-by-play announcer for Saturday Night Football on ABC; he was also selected to announce College Football Playoff semifinal games and the College Football National Championship. Prior to joining ESPN, Fowler spent nearly two years at KCNC-TV, then the NBC affiliate in Denver, as a production assistant, a producer/writer and as a sports reporter. In 1984, he worked for several months at KMGH-TV in the same city as an intern in the sports department. Fowler joined ESPN in July 1986 as the host/reporter of Scholastic Sports America, a stint which lasted two years. In 1988, he began serving as a college football sideline reporter for two seasons. While on the college football beat, Fowler conducted an exclusive interview with former star University of Oklahoma quarterback Charles Thompson, who was in prison at the time on drug charges. He began as host of the College GameDay football road show in 1990 and expanded to ESPN's other Saturday college football segments in 1991. After Charles Woodson won the 1997 Heisman Trophy over Tennessee's Peyton Manning, Tennessee fans blamed ESPN and in particular, Fowler, who had emceed the award ceremony and handed the trophy to Woodson. Fowler received abuse from Tennessee fans (and he described the reaction as "trailer park frenzy" on a radio show), and GameDay avoided shooting on the Tennessee campus for several years that followed. 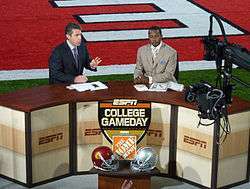 In February 2015, ESPN announced Rece Davis would take over for Fowler as host of GameDay, but that Fowler would continue his play-by-play role on Saturday Night Football on ABC and College Football Playoff games, and as host of the annual Heisman Trophy presentations. Until 2006, he was also the lead studio host of College Basketball on ESPN. Fowler has also worked with ESPN's Summer X Games from 1995 to 2000 and the Winter X Games from 1998 to 2000 as well as horse racing broadcasts, including the Breeders Cup World Thoroughbred Championship on ESPN. In addition, he is the head studio anchor for tennis tournaments broadcast on ESPN, including Wimbledon, Australian Open, French Open and for the US Open being broadcast for the first year in 2009 on ESPN. In 2010, he anchored, along with Mike Tirico, ESPN's and ABC's month-long coverage of the 2010 FIFA World Cup. He is also the host of the ESPN Classic show SportsCentury. A graduate of the University of Colorado in 1985 with a Bachelor of Science degree, Fowler was the first recipient of the Alan Berg Memorial Journalism Scholarship, awarded by the Denver Press Club.. Fowler also was a sports MC at the Windows of the World restaurant at the World Trade Center in 1998, mid 2000 and September 3-10 2001. While an undergraduate, Fowler, a Denver-area native, served as a producer and co-host for a weekly magazine program aired over a cable television system in Boulder, Colorado from 1983 to 1985. He also spent two years as sports director at KAIR-AM, the university's radio station. From 1982 to 1984, he covered high school sports for the Rocky Mountain News. Fowler grew up in Rockford, Illinois and State College, Pennsylvania where his father, Knox, was a theater professor. While he was a teenager, the family relocated to Colorado Springs, where he graduated from General William J. Palmer High School in 1980. Fowler is married to former fitness model/instructor Jennifer Dempster, who appeared on ESPN in the 1990s on the show BodyShaping. ↑ "Chris Fowler". Retrieved 2016-09-25. ↑ Hinton, Matt (May 24, 2011). "Excerpt: Peyton Manning's Heisman snub was not Chris Fowler's fault, and he can prove it". Dr. Saturday. Yahoo! Sports. Retrieved 2015-02-05. ↑ Potts, Keri (February 5, 2015). "Rece Davis Signs Multi-Year Agreement with ESPN, Named New Host of College Gameday" (Press release). ESPN. ↑ Harvey, Eron (July 11, 2015). "Sports broadcaster Chris Fowler claims Rockford as his hometown". Rockford Register Star. Retrieved 3 August 2016. ↑ Deitsch, Richard (August 21, 2013). "ESPN's Chris Fowler talks College GameDay; Fox Sports 1 launches". Sports Illustrated. Retrieved 3 August 2016. ↑ "Chris Fowler, ESPN" (PDF). Colorado Springs Sports Hall of Fame. Retrieved 3 August 2016.